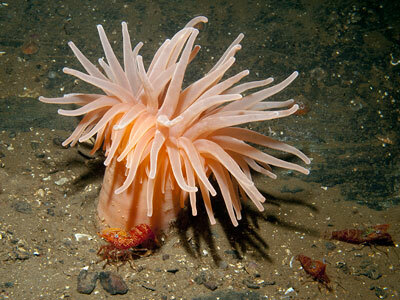 Description: This large sea anemone has a smooth column not divided into regions. The tentacles are long and stout, graceful in full expansion, longitudinally fluted in partial contraction, with a slight but definite constriction around the base. Size up to 300mm across tentacles. 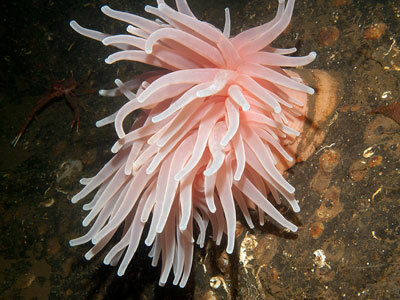 Colour varies from pale whitish, pink or buff, to orange, occasionally with dark markings around the base of the tentacles. 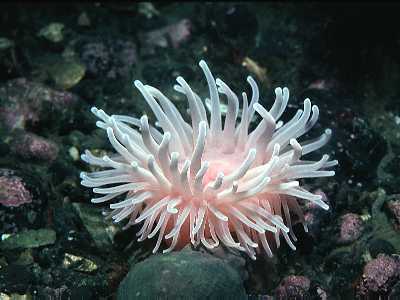 This large and distinctive anemone is capable of shedding its tentacles, pinching them off by muscular action, hence the groove at their bases. The reason for this is unknown; observations of this occurrence in nature would be welcomed. Habitat: Found in sheltered habitats attached to rocks, stones, shells, etc. From about 20m down to very deep water. Distribution: Recorded from all coasts of Britain but rare in south. 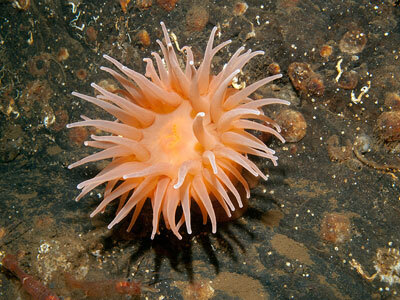 Recent records from divers are in Scottish sea lochs. Generally distributed throughout the north Atlantic, north to the Arctic Circle and east to north America. Similar Species: This species may be confused with Urticina eques, but the latter usually has a distinct pattern on the disc, its tentacles are arranged in multiples of 10 (6 in Bolocera) and there are tiny warts on the column. Lack of coloured pattern on disc. Picton, B.E. & Morrow, C.C. (2016). Bolocera tuediae (Johnston, 1832). [In] Encyclopedia of Marine Life of Britain and Ireland.